Welcome to the Sebago Furniture web site. I am delighted to offer you solid hardwood furniture that will endure many generations of use. Each piece is made with the pride of fine craftsmanship, classical precision joinery, and a hand rubbed finish. I use only the best selection of hardwood to insure proper look and fit. Minute detail to assembly, sanding, and finishing are all done by me to give you and your family an outstanding piece of furniture that can be enjoyed for generations. I offer a wide variety of standard products that you can view on this web page. The majority of my work is customized furniture based either on variations from our standard products or from your imagination. I specialize in bedroom sets and home entertainment system cabinetry, but offer furniture for all rooms of your home or office. Sebago Furniture is based in the heart of the Southern Maine Lakes Region. This is a great location for building some of the finest pieces of heirloom furniture you will ever own. 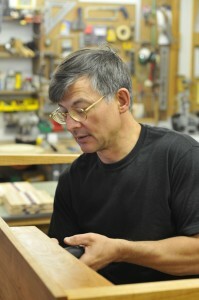 For two decades, I have handcrafted nearly a hundred pieces of fine furniture and several other custom projects. Many of the pieces are shown here on this web site. I want to provide you with a high quality unique piece of furniture designed to last. I believe that furniture designed for the individual has special meaning, and will be treasured by you and your family for generations. Because each piece I make is handcrafted by me, individual features can be built in just for you. Dimensions of an individual piece can be changed to suit your requirements for a particular location or need in your home. Finishes and stains can also be altered to accommodate your preferences, and use. Wood types for the overall piece or for details and accents can be modified to suit your taste. Pulls, knobs, handles and other finishing touches are available in a wide variety of styles, materials colors and designs. My goal is to make a unique furniture piece to please you, that you will make the best use of in your daily life, and that you and your family will be proud to own for years to come. Please, scroll through our website to view examples of my work, find out about the design, the material options available and get answers to questions you may have. If you see a piece from the collection that is close to meeting your needs, please contact us so we can work with you to customize the design. My background is in electrical engineering. I have practiced this profession for well over 28 years. I have worked for some larger companies, but mostly small venture capital startup companies including one I started with a partner in the mid 1990s. While I am formally trained in data communications engineering with a Masters degree in Robotics, I have always had a passion for creating something new to solve a practical need. Over the years I grew a passion to create things of practical beauty in wood. I have found woodworking to be a creative outlet. My passion took me to building my own post and beam home in the early 90’s, mostly single-handed. I used some of the wood from the land the home is built on for the interior finish details and some of the pieces of furniture now in the home. The desire to architect, engineer and build my own home was inspired by the Shelter Institute. I took their course in the 80s. I recommend anyone with an interest in building their own home either by hand or with contractors to take this course. It is a practical blend of the theory and hands on work. As part of my interest in house building and its many mechanical systems, I decided to train for doing home inspections. Now I am a certified home inspector as well. I have also enjoyed working with audio equipment from a young age. I have researched, designed and built a number of audio systems. Now I am combining my passion for woodworking, engineering and a desire to create handcrafted well designed furniture for home theater. The two are a blend of old world craft with the new high tech world. I hope I can lend some of my passion to you and create something of lasting practical beauty.